A United States patent for a hydrofoil was defined in the late 1880s, about the same time as the early airplane and airfoil patents. The earliest record of a successful hydrofoil flight is 1894 when the Meacham brothers demonstrated their 14 foot test craft at Chicago. The early attempts to exploit the hydrofoil concept were frustrated by lack of suitable structural materials and power plants. However, advancement in these areas has permitted development over the past 30 to 40 years of reliable and effective hydrofoil ships for both military and commercial applications. 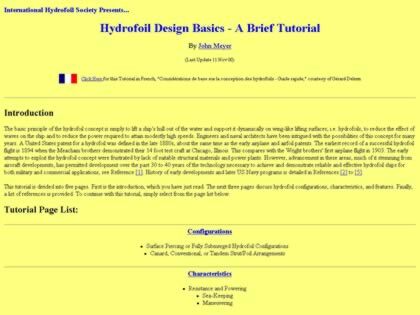 Web Site Snapshot: If available, above is a snapshot of the Hydrofoil Basics - A Brief Tutorial web site at http://foils.org/basics.htm as it appeared when this site was added to the directory or last verified. Please Note that Boat Design Net has no involvement with the above web site; all content and images depicted in the above thumbnail are the property and copyright of Hydrofoil Basics - A Brief Tutorial unless otherwise noted on that site. Description: A United States patent for a hydrofoil was defined in the late 1880s, about the same time as the early airplane and airfoil patents. The earliest record of a successful hydrofoil flight is 1894 when the Meacham brothers demonstrated their 14 foot test craft at Chicago. The early attempts to exploit the hydrofoil concept were frustrated by lack of suitable structural materials and power plants. However, advancement in these areas has permitted development over the past 30 to 40 years of reliable and effective hydrofoil ships for both military and commercial applications.